Display text as a bulleted list. 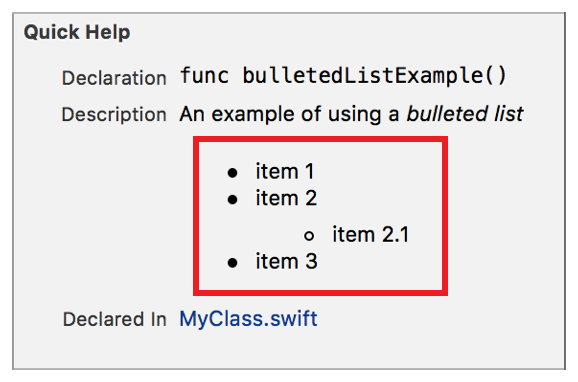 Bulleted lists use an asterisk (*), plus sign (+), or hyphen (-) to delimit each item. There is at least one space between the delimiter and the item. The delimiter has no effect on the marker shown in the rendered text. Using a different delimiter starts a new list. The number of spaces before an item delimiter indicates the level of the list. All first level items start with up to three spaces. Add four spaces or one tab for each additional level, to a maximum of three levels. For more information, see Nesting Delimiters. List content separated by a single empty line renders as a paragraph. For more information, see Multiline Elements. The markup below changes the list delimiter and renders as three separate lists. Lines 2 and 3 are are rendered as list A in the srcreenshot. 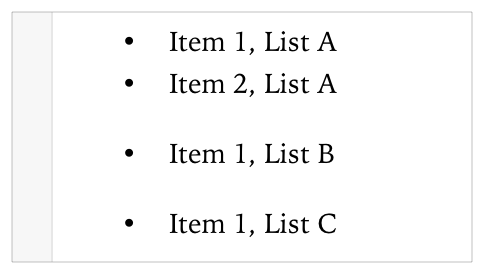 Line 4 renders as list B, and line 5 renders as list C.
Lines 4-7 below mark the four items in a list with two levels. Line 6 is the indented list item. The screenshot shows how the list appears in Quick Help.